Submerge in an exhilarating gameplay on Hot Sync Slot, a game with modern day design and features! Created by Quick Spin, the slot seems like it’s sitting in the centre of an incredible diamond. The outstanding reels are centrally placed and are turquoise. This tip-top 5 reels and 20 paylines game will surely hook you up with its fine style. If you are the proud owner of a desktop, smartphone or tablet, feel free to cook up some fun on Hot Sync Slot! Hot Sync Slot is a very easy game to play. You must simply log onto your account at Wicked Jackpots and launch the game. Once set, you will be required to pick the favourite bet amount before pressing the spin button. The goal is to match 3 or more symbols along a payline to reap a win. The set of symbols that makes up this game are Bonus Game, watermelons, Hot Sync Wild, plums, Wild, blue stars, lemons, diamonds, cherries, red 7s and golden bells. 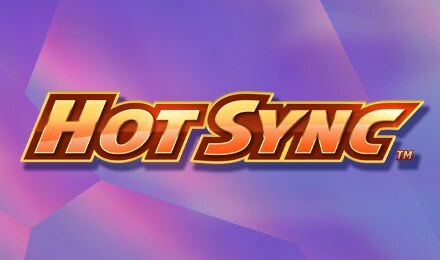 Bet Levels: Hot Sync Slot doesn’t contain any Bet Levels. Amount of Paylines Selection: The slot has 20 paylines throughout its gameplay. It stays active from the start till the end. Coin Values: Pick the coin value of your choice on the Total Bet tab! Use the up or down arrows to set a minimum of 0.20 up to a maximum of 100.00. The Yellow Wild Logo stands for the Regular Wild Symbol of the game. It takes the place of all other symbols when appearing on the reels to comprise winning combos, bar the Scatters and Hot Sync Wilds. The Bonus Game logo on Hot Sync Slot is none other than the Bonus symbol. This enticing symbol is significant to trigger the Free Spins Feature. Landing 3 Bonus Scatter Symbols in any position on the reels will trigger the Free Spins Bonus! You will then catch hold of 8 free spins. In this bonus game, the reels that contain Scatter Symbols will be highlighted and have better possibilities of getting Wild symbols. What’s more? The Hot Reels remain active for the duration of the Free Spins Feature! This astonishing symbol aids you to initiate the Hot Sync ReSpin. Getting 2 or more Hot Sync Wild Symbols in the same spin will generate the Hot Sync ReSpin! Each time a Wild Symbol lands, a re-spin is granted. This appealing feature continues until there are no more wild symbols on the reels. Have an excellent spinning adventure on Hot Sync Slot!